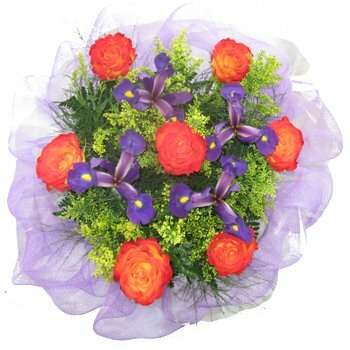 If you could put a touch of sunlight and a dash of moonlight together, you might create this lovely bouquet. Whimsical roses in the shades of sunrise are artfully arranged with deep blue irises blooming against backdrop of a white ribbon cloud. Perfect for Mother's Day, Housewarmings, or simply to say you care, order the Night and Day Bouquet for someone special in your life today.